The media has been conditioning us to accept a Hillary Clinton presidency since the start of the George W. Bush administration. In 2002, few people could have envisioned that an organization like Wikileaks would exist and constantly unleash a barrage of secret digital communications from high-profile figures detailing just how extensive the collusion is between the corporate media in the United States and the country's quasi-hereditary ruling elite. We now know that Hillary Clinton did not just recently decide to pick her vice-presidential running mate, Tim Kaine, but had him in the shadows for at least a year, if not more. We now know that reporters apologize when they publish something they think our Democratic overlords will find disagreeable, and that the current level of collusion makes the Fourth Estate nothing more than an extension of the Executive Branch. In the same way that reporters are given "exclusive access" if they behave, privileges which allow their careers to blossom, so do Hollywood's movie producers find themselves subservient to the wishes of the politically anointed. 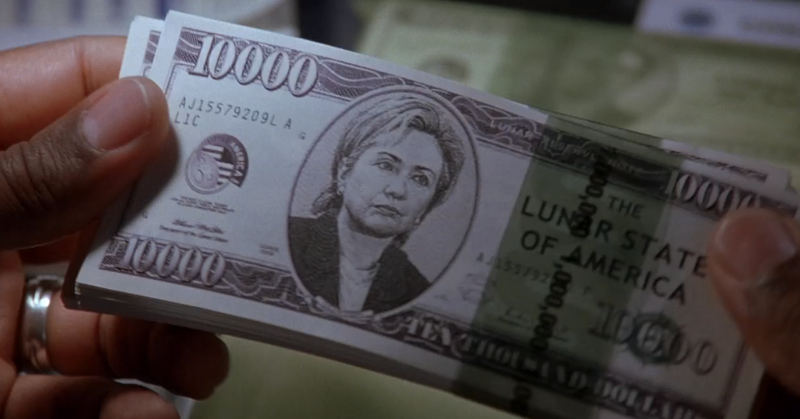 It is not a coincidence that Pluto Nash told us we could one day use currency with Hillary Clinton's face to buy Trump real estate: the media elite and the political ruling class have co-existed in parasitic symbiosis since the prelude to the War on Terror, a conflict which has seen the largest consolidation of power in the history of the American republic. As the media conglomerates feel their grip on the public consciousness slipping away, do they more desperately work to consolidate power, needing to rely on the politicians whose rise to power they've guaranteed by surreptitiously and blatantly conditioning the American people. Few moviegoers saw The Adventure of Pluto Nash, but the elite have a sick sense of humor and don't mind financing a horribly unfunny science-fiction movie that conditions us to accept what is soon to become our horribly unfunny reality.